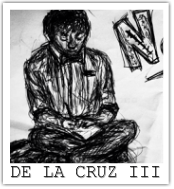 Norbert De La Cruz III was born in Bayombong, Nueva Vizcaya, Philippines and raised in Los Angeles, CA. As a New York and Los Angeles based freelance artist he has been exploring his practice with Contemporary Concert Dance. He was trained classically in a Cecchetti and Vaganova by ballet masters Vera Ninkovic and Marat Daukayev. His somatic practice is shaped by his eclectic training and performing experiences at the Gabriella Foundation in LA, LA County High School for the Arts, Marat Daukayev School of Ballet, and at The Juilliard School where he received his BFA in dance. He has performed professionally as a soloist in the Metropolitan Opera production of Aida, Aszure Barton & Artists in Germany & Austria (Blue Soup & Busk), Balletto Teatro di Torino (Italy), Sydney Skybetter & Associates, Santa Clarita Ballet’s Midsummer Night’s Dream, Lustig Dance Theatre, Aspen Santa Fe Ballet, Gallim (Lacoste Promo), and Complexions Contemporary Ballet. He represented the Juilliard School at Kodak Theatre’s first annual Dizzy Feet Foundation Gala in Hollywood, CA. As a dancer, Norbert has performed works by choreographers José Limón, David Parker, Adam Hougland, Johannes Wieland, Ohad Naharin, Aszure Barton, Jerome Robbins, Larry Keigwin, Jiri Pikorny, Hernando Fernando Magedan, Spenser Theberge, Jeremy McQueen, Camille A. Browne, Dwight Rhoden, Desmond Richardson, Lightfoot & Leon, Crystal Pite, Alonzo King, Zachary Tang, Gregory Dawson and Jirí Kylián. Norbert was further mentored by esteemed Aspen Santa Fe Ballet (ASFB) Directors, Tom Mossbrucker and Jean-Philippe Malaty. His choreographic career was further recognized through the kind support of the Jerome Robbins Foundation’s NEW Essential Works Grant (2012), commissioning his first large-scale ballet, “Square None” (2012) with ASFB. He was a finalist of Hubbard Street’s National Choreographic Competition (2013), a Princess Grace Foundation-USA Award under the choreography fellowship (2012), Alvin Ailey New Directions Choreography Lab (2013), finalist for the Joffrey Academy of Dance’s 2014 Choreographer of Color Award, and a recipient for the 2015 National Choreographic Initiative choreographer in Irvine, CA. He was recently selected for the 2017 and 2018 Spring Sessions at the New York Choreographic Institute, an affiliate of New York City Ballet, where he created his “Lunar” and "Traces" ballet working alongside Juilliard Composer, Nathan Prillaman. He has since been commissioned to create and premier new works for companies such as Aspen Santa Fe Ballet, Hubbard Street 2, Joffrey Academy of Dance, James Sewell Ballet, Tulsa Ballet II, Barak Ballet, Grand Rapids Ballet, Ballet Florida, Attack Theatre, Ballet X, and Periapsis Music & Dance.